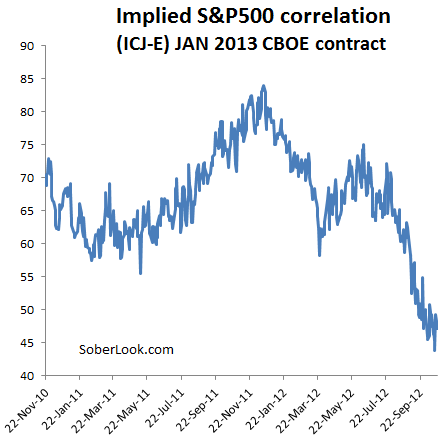 The implied correlation futures contract has touched a new low recently. With the Eurozone seemingly stable for now, correlations among US stocks have declined. That means share prices are now driven to a somewhat larger extent by company fundamentals than by macro events in Europe. This is good news for stock pickers who have struggled to outperform the market in recent years (see discussion). Alpha generation by strong portfolio managers should improve. For those interested in learning more about how the implied correlation index is computed please see this paper from the CBOE.